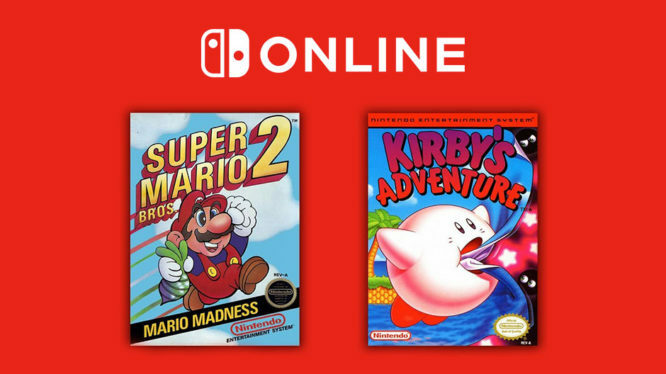 A little later than usual, but Nintendo has finally revealed the two new NES titles that will be available for Switch Online subscribers on February 13th, 2019. This month sees the addition of Kirby’s Adventure and Super Mario Bros. 2 to the ever-growing library of NES classics. Kirby’s Adventure is the follow up to the beloved Game Boy game, Kirby’s Dream Land. Gather the broken pieces of the Star Rod, scattered throughout a world filled with nightmares. You’ll need to use Kirby’s 20 unique tricks and take advantage of his ability to steal enemy powers by gobbling them up to complete your mission. Failure to do so will mean a life of terrible nightmares for the residents of Dream Land. Super Mario Bros. 2 is perhaps the most unique game in the franchise, having started life as the Japanese exclusive Yume Kōjō: Doki Doki Panic. The game sees Mario, Luigi, Princess Toadstool and Toad joining forces against the evil Wart. Work your way through seven worlds, picking up items and throwing them at enemies to clear them out of your way. It’s an interesting piece of video game history and is worth checking out. Last month saw Zelda II: The Adventure of Link and Blaster Master’s debut on the Switch’s Nintendo Entertainment System app. As has become a regular occurrence, special versions of Ninja Gaiden and Ghosts’n Goblins were also included in January’s update. We’ll need to wait and see if Nintendo has more “SP” editions of NES games in-store for retro fans this month.